Inflatable Football Game Hire. Book Football Theme Games Today! Are you wanting to host a Football themed event? 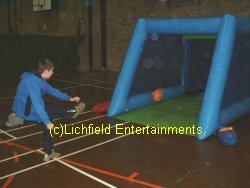 Well then look no further, Lichfield Entertainment's offer a variety of inflatable football games for hire. The inflatables can be hired individually or we can put together an excellent package of suitable football theme amusements for your party. This football theme game is an inflatable goal with 4 target circle cut-outs for the kicker to try and kick the ball through. Similar idea to the standard inflatable penalty shoot out game but instead of aiming for the target holes you kick the ball into the inflatable as hard as you can and the ball speed is registered and displayed by a speed radar system! Both inflatable football theme games are great for fun days and fetes and go down especially well alongside the football themed Bouncy Castle and Human Table Football. Full size and junior size footballs are provided with both inflatable football theme games. So what are you waiting for? Hire your inflatable football theme game today and get your party started in the right direction. If you have any queries, questions, or would like to hire some of the football theme games for your event please call us on the number below or click to enquire and we will do all we can to help.